Does it ever feel like your emotions are out of control and taking you on a ride you can’t escape? Have you ever completely lost your temper without really meaning to and regretted it later? One minute you’re totally fine and the next you feel like you’re about to explode. You go from happy, to angry, to an emotion you don’t have a name for and back so quickly, you’re not even sure what happened. You’re yelling and still not getting what you want. You’re shutting down, making it impossible for anyone to help you. It’s like no one can hear you and it makes you feel like you’re out of control! It’s OK, this is TOTALLY normal in the tween and teen years, but that doesn’t make you feel any better. That’s the bad news. The good news is that it can be better. Imagine feeling calm and in control when difficult emotions arise. Instead of blowing up, you have strategies to cope and regulate yourself. Others will be able to *hear* you so much better when you can manage your emotions, which means you’ll be able to get what you need. Think of how much taller you will stand when you know your own strengths, when you find what makes you powerful. I know you want to be a girl that oozes confidence. Someone that other people want to be around. How? With skills that you can learn! 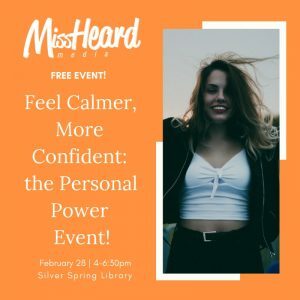 I’m teaching a FREE event on 2/28 at the Silver Spring Library from 4:00-6:30 pm that teaches tween and teen girls to manage those difficult and challenging emotions and harness their unique power. In the 2.5-hour event, you will learn life skills that will help make your life calmer, easier, and better! After the event, you’ll feel more confident and prepared to handle whatever comes your way, which will help you at home, in school, and anywhere else you show up. By the end of our time together, you will leave with a personalized plan to manage your own unique challenges, an understanding of your personal strengths, and a positive mantra that will help you in difficult times! This event is completely FREE, so space is extremely limited. Are you ready to be calm, cool, and confident, even in the face of challenges? ← Meet the New Teen Advisory Board Members!